Do you have an intense throbbing in your tooth that started as a dull ache that won’t go away? Does your tooth sensitivity to hot or cold food last for more than sixty seconds? If so, you may need root canal therapy. Don’t fret! 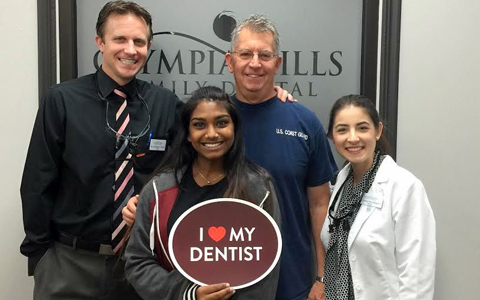 Your Olympia Hills Family Dental team can relieve your tooth pain and save the infected tooth. Dr. Hafen and Dr. Gonzalez aim to provide you and your family with the very best restorative care. If you are suffering from intense tooth pain, please schedule an appointment at our Olympia Hills Family Dental office as soon as possible. What is a Root Canal, and How Can it Help Me? Each tooth contains a pulp chamber filled with living connective tissue. Nerves reach the pulp chamber and connect your tooth to the nervous system through tiny passages in your tooth roots. These passages are called ‘canals’ and when the nerves inside the tooth die due to decay or trauma, it rots and the pressure in your tooth continues to build until a root canal procedure is performed. Because the tooth no longer has blood supply, it can become brittle over time and more susceptible to breakage. In most cases, your dentist will place a dental crown over your tooth after a root canal to protect and preserve your tooth. What are the signs that my root nerves are damaged? The best way to prevent decay and damage is to take are of your teeth by maintaining proper dental hygiene techniques and to meet regular cleaning and exam dates.